Provided photo Edison State President Dr. Doreen Larson and Reformed University Rector Helis Barraza sign an agreement to support Spanish language instruction and cultural awareness opportunities for students. PIQUA — Edison State Community College President Dr. Doreen Larson and board of trustees chairman Tom Milligan recently traveled to Barranquilla, Colombia, in South America to visit the Reformed University (Corporacion Universitaria Reformada or CUR) to further discuss partnership opportunities. It was during this visit that President Larson and Rector Helis Barraza signed an Agreement for Spanish Language Instruction and Related Cultural and Faculty Exchange. This signed agreement will provide online Spanish language instruction from faculty at CUR to students enrolled in Edison State Spanish courses. The agreement also supports opportunities for students to visit CUR for advanced Spanish language immersion studies and cultural awareness experiences. While visiting South America, President Larson and Chairman Milligan co-taught a three-hour economics seminar at CUR, participated in a campus tour, and took part in other activities. President Larson was also given the opportunity to provide the keynote commencement speech for the university in Spanish. Discussions of partnership opportunities began earlier this summer when Rector Barraza and Vice Rector for Academic Affairs Milciades Pua visited Edison State. While on campus, CUR leaders met with President Larson and members of Edison State’s leadership team to explore joint coursework options. The partnership was initiated through Chairman Milligan’s involvement and leadership in the Presbytery of the Miami Valley’s Colombia Mission Partnership and Presbyterian World Mission’s Colombia Mission Network. 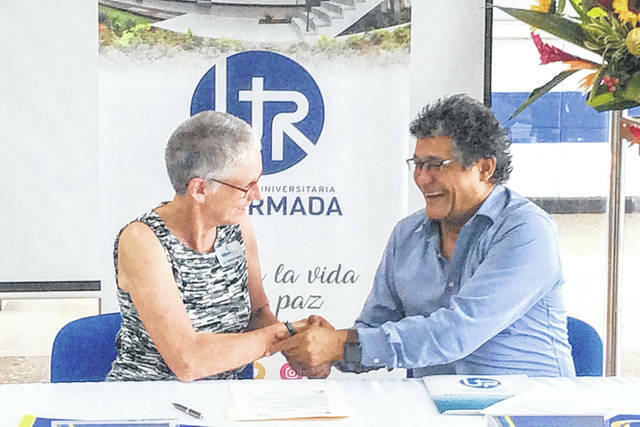 https://www.dailycall.com/wp-content/uploads/sites/30/2018/09/web1_CURPartnership.jpgProvided photo Edison State President Dr. Doreen Larson and Reformed University Rector Helis Barraza sign an agreement to support Spanish language instruction and cultural awareness opportunities for students.